The holiday season can officially start, I’ve made Peppermint Biscotti. Anyone that knows me; knows that biscotti is one of my favorite cookies to make, and I’m always throwing something new into them. My holiday baking isn’t complete until I have made 10 different kinds of biscotti for my friends, and family. Perhaps it my coffee addition that draws me to these wonderful dunk-able cookies, or the crunch I get when I bite into them. 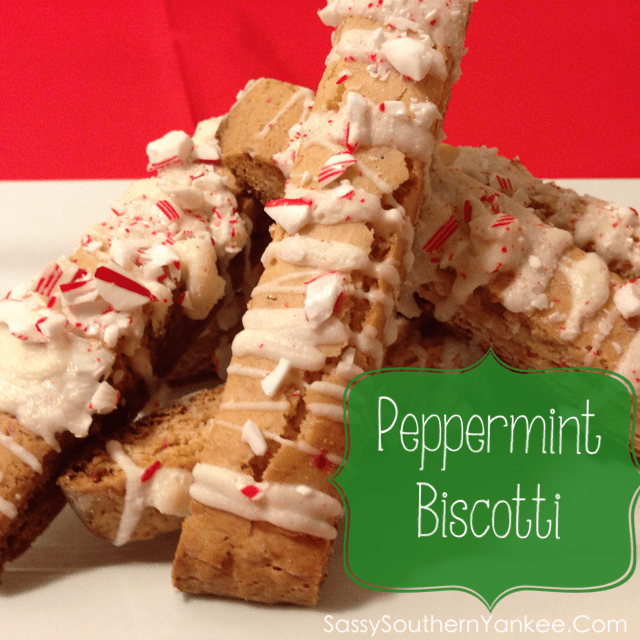 Either way these Peppermint Biscotti are a wonderful addition to any tea or coffee. Preheat oven to 350 degrees F. Line baking sheet with parchment paper or foil. In a large bowl or your stand alone mixer, beat on medium speed the butter, eggs, sugar and peppermint extract until combined. Then add the flour, baking powder and salt. Once the dough begins to form add in crushed peppermint. Mmmmmm smells so good! On a floured cutting board, divide dough in half. Depending on the constancy you might need to kneed 1/2 C extra flour into the dough so it’s not too sticky. Then shape each dough half into a long roll, approximately 14-16″ long. Carefully place rolls on prepared baking sheet, about 3″ apart from each other. With your hand, press down each roll so that they are approximately 1/2″ high. Bake for 25 minutes or until golden brown. Carefully remove from pans, and place on cooling racks. Set aside baking sheet, as it will be reused. When biscotti had cooled enough to handle, but is still warm, carefully move them to a cutting board and cut crosswise slices (approximately 1/2″ in size). Place slices, cut side down, back on original baking sheet. Bake for 5-10 minutes or until somewhat firm. Transfer to wire racks to completely cool, with tops upwards. Place white chocolate chips and coconut oil/shortening in a small bowl. Heat for 20 seconds to melt chips. Stir, and if necessary, continue microwave at 5-10 second intervals to completely melt chocolate. Place chocolate in a small zipper-style plastic bag, seal, and snip off a very tiny corner of the bag. Squeeze out white chocolate through this small hole (increase size if necessary) and drizzle back and forth over the tops of the biscotti. While drizzle is still wet, sprinkle with crushed peppermint candies. Amazing but true, the shelf life of Biscotti are three to four months without preservatives or additives. 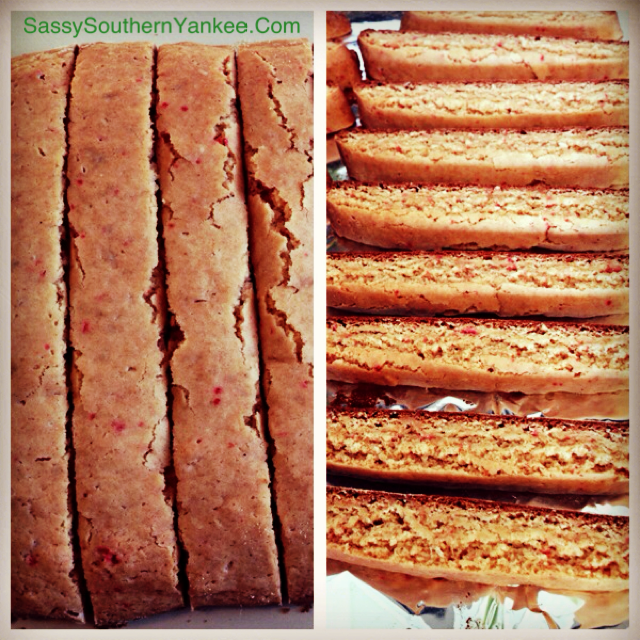 I hope you enjoy these Peppermint Biscotti. Happy Holidays! In a large bowl, beat on medium speed the butter, eggs, sugar and peppermint extract until combined. Then add the flour, baking powder and salt. Once the dough begins to form add in crushed peppermint. On a floured cutting board, divide dough in half. Shape each dough half into a long roll, approximately 14-16" long. Carefully place rolls on prepared baking sheet, about 3" apart from each other. With your hand, press down each roll so that they are approximately ½" high. Bake for 25 minutes or until golden brown. Carefully remove from pans, and place on cooling racks. Set aside baking sheet, as it will be reused. When biscotti had cooled enough to handle, but is still warm, carefully move them to a cutting board and cut crosswise slices (approximately ½" in size). Place slices, cut side down, back on original baking sheet. Bake for 5-10 minutes or until somewhat firm. Transfer to wire racks to completely cool, with tops upwards. Place white chocolate chips and Coconut Oil/ Shortening in a small bowl. Heat for 20 seconds to melt chips. Stir, and if necessary, continue microwave at 5-10 second intervals to completely melt chocolate. Place chocolate in a small zipper-style plastic bag, seal, and snip off a very tiny corner of the bag. Squeeze out white chocolate through this small hole (increase size if necessary) and drizzle back and forth over the tops of the biscotti. 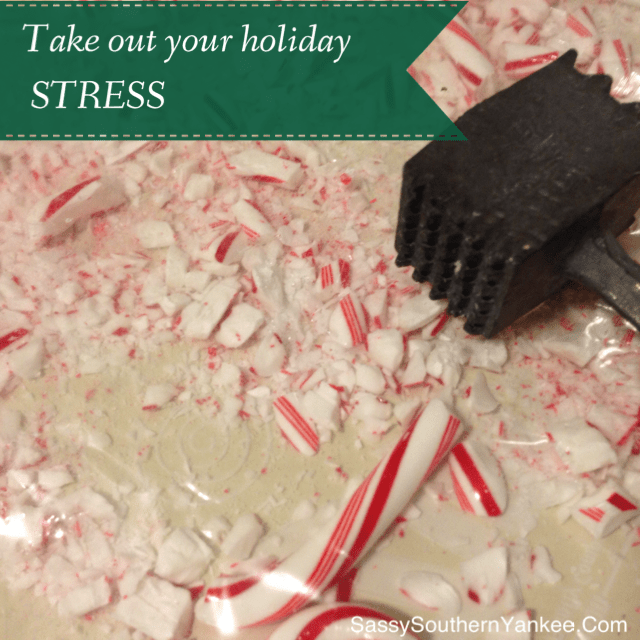 While drizzle is still wet, sprinkle with crushed peppermint candies. This entry was posted in Cookies and tagged Biscotti, Candy Cane, Cookie, Dessert, Holiday Cookie, Holiday Dessert, Peppermint, Peppermint Biscotti, White Chocolate.